Buggie and Jellybean: Did someone say Halloween?! As the Halloween catalogs start rolling in, my daughters mind has started reeling. "Mommy I want to be Jessi for Halloween." "Um how about I be My Little Pony." Or get this new one. "Mommy I think I want to be a Barbie Motorcycle Girl." Um that got squashed in two secs my friends. But really it is Sept 7th, October is knocking on our doors. I plan on upping the Halloween decor this year. Which means lots of DIY. So I thought I would share two projects from last year. Anywho happy crafting and I will be back with some new stuff for this year! I'm with you on the DIYing! I have already made a burlap banner & am about to make a burlap monogram for a frame!! <3 Halloween is so fun! My girls are going to be wonder woman & super girl! Love your yarn wreath! I just made my first and am in love with them. Oh your wreath is so fabulous! 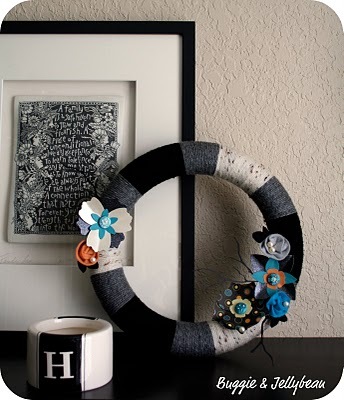 I love an amazing yarn wreath!! This is the wreath that inspired me to start making them last year! I have made several for myself and as gifts since then. Working on a yellow, cream and red one for my sister right now! Thanks! LOVE both of them. Love. Did I say, love yet? I love me some good texting. 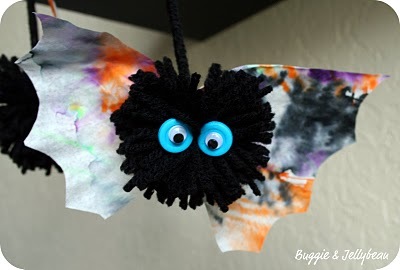 Halloween garland with a side of bats.